Servant-leaders must create a strong foundation that helps people feel empowered to take action, enables them to move forward in a common direction despite uncertainty, and to feel inspired and resourceful during challenging times. The 4 V’s can help you establish this strong foundation: Vision, Values, Value, Validation. A strong vision helps people see where they are going and what they want to be true when they get there. While we may disagree on how to get there, it is likely we can find a common understanding of what we want to be true. A struggling team or organization may not agree on how to change their process of working or even on the right solutions for the problems they are trying to solve. However, it is likely that they can agree on some things they would like to work towards and how they want to feel. We want more focus in our work, so we can get the important things done. We want to delight our customers. We want to love coming to work, feeling like we are part of a supportive community. We want to revolutionize _____. We want to be continuously learning and growing our skills and knowledge. A vision also helps people tap into the feelings of the future state when things get tough and unite people when division surfaces. It is a reminder of why we are doing the work, and it helps people continue forward despite setbacks. A strong vision is clear, concise, and emotionally impactful. The next time you sense your team is moving in different directions or maybe churning over unresolved issues, what powerful questions can you ask to help everyone focus on a creating or re-aligning to a shared vision? A vision is stronger when it is connected to the values of individuals, teams, and the organization. As human beings, we each have values. Values help us live our best lives, understand others, and work more effectively in teams. A servant-leader helps connect people to their values and a greater purpose, so they can experience greater successes and growth. When it comes to values, remember that people often interpret values differently. And that is why discussing them is important. Approach it with respect and openness. Be cautious of “weaponizing” values. Get curious when there seems to be a disconnect. Approach conversations from the belief that all values are valid, and everyone is acting with the best of intentions. A vision connected to values creates an emotional impact. People will feel a more meaningful connection to why they are doing the work. When the work feels good, many benefits will follow both for successful outcomes as well as for the growth of individuals and the collaboration of the team. The next time you sense a lack of resonance, or especially dissonance, between people and the work they are doing, get curious about this. Is something out of alignment with the individual, team, or organization values? How can you create transparency so that people can work through the issues? More and more of the work people do in the world is about creating valuable solutions to complex problems. This means we need to focus more on outcomes than on the outputs. It’s not just about how much stuff we can create; it’s about the value or benefits that stuff provides. You need to clearly define what value means to you, your team, your organization. It is very easy for teams to get disconnected from the value of the work they are doing, especially if they are providing services or products that are not used by an external customer or paid for directly. Servant-leaders help people get clear on how the work they do connects to customer value and business value. If the work you are doing is for-profit, value will ultimately tie back to money. But it also ties back to creating happy customers because people pay for things that make their lives better, easier, joyful. If the work you are doing is non-profit, value will often manifest in terms of the benefits to society. It still ties directly back to money because the money you have to spend to create the benefits is usually limited. The next time it feels like people are disconnected from the value of their work, ask some powerful questions to help people connect the dots to how their work matters. And if it doesn’t, then perhaps the work needs to change, and you can help bring transparency to that. Value is only an assumption until validated by the market. In order to navigate towards a greater vision and the creation of valuable outcomes, you have to actually put something out in the world and validate if the assumptions about value were correct. Then you can learn how to create even more value or course-correct. The earlier you get feedback, the earlier you can adapt towards more valuable outcomes. In order to create alignment, engage EVERYONE in creating this strong foundation. 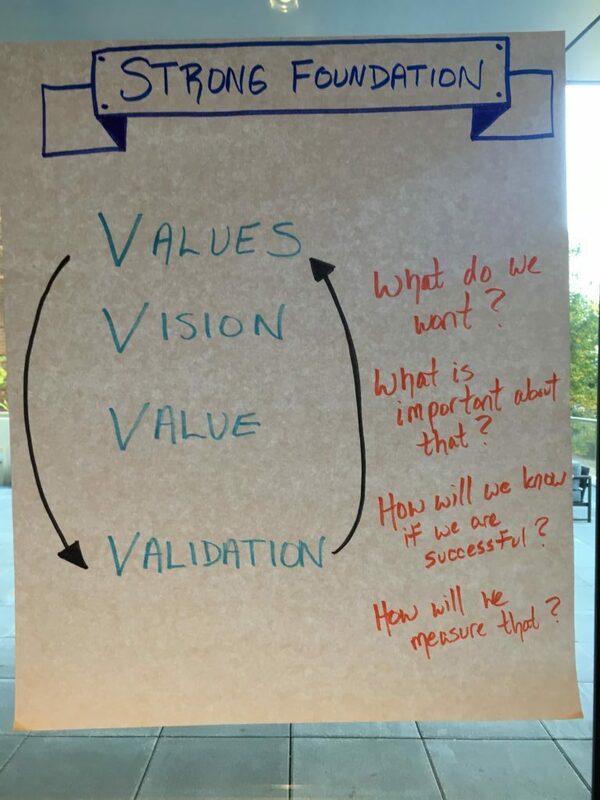 Even if a vision, a set of core values, and a definition of how you measure value already exist for your organization or your team’s products/ services, engage people in a conversation about these things. Servant-leaders create an environment of inclusivity, openness, and curiosity. Different perspectives will be shared, and people will start to discover greater clarity in what these things mean to them, their peers, and the organization. Then they can move forward in the journey together. Remember that is not a one-time only activity. You must continuously reinforce and ensure there is alignment across all 4 V’s. And you may need to adapt one or all of these as your environment and goals change. If you are in a management position, reflect on how you are creating the space to have regular collaborative discussions about the 4 V’s with those who report to you, the managers who are your peers, and the managers you report to. Consider ways of making the 4 V’s more tangible and visible to everyone. Consider when it is best to encourage others to share and explore their own ideas rather than providing answers. That is an interesting idea. How will that move us towards [vision/ goal/ etc]? What outcomes can we measure as we implement this new approach to help guide us? Which of these ideas feels most connected with our core values and the outcomes we want to create for our customers? My perspective is ________. How can you help me improve upon this and offer alternative perspectives, so we can move in a better direction together? What if we try [IDEA/ EXPERIMENT] for X weeks and then assess the outcomes and what we learned in the process? What most excites you about ________? In what ways do you most want to learn and grow right now? If you could do anything and had every possible resource available, what would you want to create?